This song and many others were written by Azhwars. Sriman Naathamuni was greatly excited and enchanted with the exquisite beauty of the poems. He approached the devotees and enquired about its origin. The ending of the 11 poems, "aayiratthuL ippatthu,"(means this ten of the thousand) suggested that there are many more such poems (may be thousand?). This possibility intrigued Sriman Naathamuni. Unfortunately, the devotees were unaware of any other poems besides the eleven they had just finished reciting. However, they suggested to Sriman Naathamuni that he may try enquiring in the town of Thiruk kurugoor (AzhwAr thiru nagari) near Thirunelveli. So he set out to travel from Kaattumannarkudi to Thiruk kurugoor, a long journey indeed in his time. There he found one Paraangusa daasar. From him, Sriman Naathamuni learnt 11 more paasurams called 'kanninuN sirutthaambu'. These were composed by Madhurakavi AzhwAr and all 11 paasurams are in praise of kurugoor SadagOpan (Nammazhwar). Sriman Naathamuni was excited to have doubled his collection. But this only enhanced his desire to seek out the more than 1,000, promised in the first set of paasurams he fell in love with at his home town. Paraangusa daasar suggested that he repeatedly recite this great kaNNinuN sirutthaambu (sung in praise of Sri Sadagopan- NammazhwAr) in the hope of pleasing the Lord. 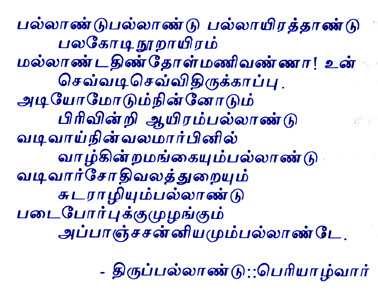 Sriman Naathamuni took his advice sincerely and recited it about 12,000 times! It is said that NammAzhwAr was impressed with Sriman Naathamuni's persistence and appeared before him. NammazhwAr was so impressed that he revealed to Sriman Naathamuni not just the 1102 paasurams of his own "Thiruvaay mozhi", but also all the rest of the paasurams composed by the other eleven AzhwArs. From this, we may deduce that it is Sriman Naathamuni, who gathered the Tamil treatise (these 4000 poems) praising Lord Vishnu composed by the twelve AzhwArs. 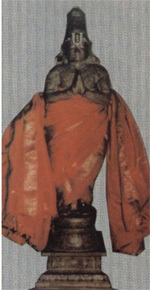 Sriman Naadhamuni called this collection of paasurams or prabhandams 'Naalaayira Divya Prabhandam' or 'Draavida Vedham'. He set them to music as they were originally sung by the Azhvars. He taught them to his nephews Melagaththaazhvaan and Keezhagaththaazhvaan and also to his son Isvaramuni and grand son Aalavandhaar. Later Aalavandhaar taught those to his disciples Peria Nambi, Peria Thirumalai Nambi, Thirumalai Aandaan etc.. They in turn taught them to Sri Ramanujacharya (1017-1137 AD), who publicised them among his followers. There is much debate about the exact historical dates for the twelve AzhwArs. It is believed by devotees that most of the AzhwArs lived prior to kali yuga, i.e. at least 3000 years ago. Historians place the Aazhvaars in the range of 5th to 9th century. In any case, we can be sure that the AzhwArs lived much before Sriman Naathamuni (826 A.D.) since it was only during his time that the AzhwAr pAsurams had become unknown. Out of the 12 Azhwars four were from Thondai Naadu, four from Pandiya Naadu, three from Chola Naadu and one from Malai Naadu. Andal who is also called as "Soodikkodutha Sudar Kodi" is said to be the daughter (brought up) of Peri Azhwar has created "Thiruppavai" in which she considers Lord Vishnu as her husband. She is the only lady Azhwar. The Azhwars came from all walks of life and all strata of society. In the Tamil-speaking region of South India, these saints revitalized the Indian religious milieu, sparking a renewal of devotional worship throughout the subcontinent. Traveling from place to place, from temple to temple, from holy site to holy site, they composed exceedingly beautiful poetry to their Divine Beloved, Vishnu, as an expression of their love for Him. Anyone can see why their poetry was so attractive; at once both impassioned and philosophical, their words cut across all barriers of caste and class, attracting all to their faith. In doing so, they sculpted a new religious heritage of intensely emotional bhakti, or love of the Divine, whose impact is still felt today in the Indian religious life. You will find there also information on how to search and print them in Tamil or Roman script. Click here to view a slide show of all the 12 Azhwars.